Each Craftsman style diffuser is made with a steel damper which will open and close off your homes airflow. This aluminum register is meant for wall and ceiling installation and comes with pre drilled screw holes. Made by hand, the Craftsman style covers are fashioned with a 1/4" thick faceplate. Also unique, the aluminum register is made with a sand cast mold here in the US. 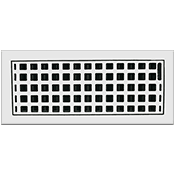 Our Craftsman style vents are great to use in the bathroom or rooms with moisture since the aluminum will not rust. Order the aluminum register either in a painted white, brown or black finish or simply leave bare for a great chrome look. The Craftsman style vents are a one of a kind look that any friend or family member will admire. 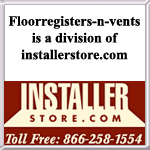 Use the aluminum registers to diffuse hot and cold air in your home efficiently while still looking good. Tip: This Craftsman style diffuser should be ordered according to your ductwork measurement The 10 x 4 aluminum register will fit into a duct opening measuring 10 x 4 inches. Each unit will have 2 more inches added to the faceplate for mounting purposes. Overall dimensions could vary since they are handmade. Important: All Craftsman style vents are considered special ordered items which are non returnable and cannot be canceled once placed. These aluminum registers are made to order once a payment has been received and will ship between 7 to 9 weeks. Air returns in the Craftsman style are also available for purchase if a damper is not needed. Otherwise, choose an aluminum register from other Classic Grille designs to appeal to your taste. This Craftsman style vent will restate your desire for design and purpose from your homes furnishings.